There are podcasts for literally every topic you can imagine. There are, of course, the entertaining podcasts like Two Dope Queens and The Moth, but you can also find informative podcasts about all kinds of niche business topics. And let’s face it–in the gig economy, there’s no other way to succeed except by being at the top of your game. There are podcasts that will help you with the craft of writing, the business of writing, the business of being creative, and productivity. Created and run by Rob Marsh and Kira Hug, The Copywriter Club offers all kinds of paid resources and programs for copywriters looking to start out or truly up their game. 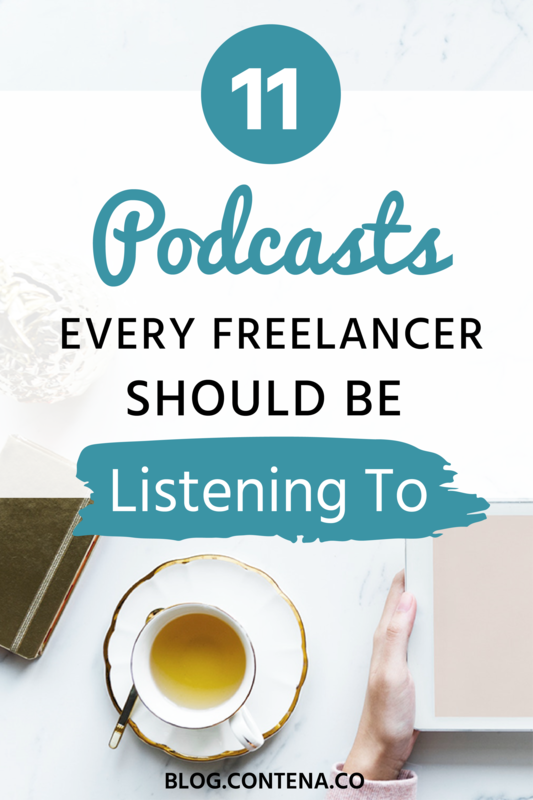 Their podcast, however, is free and filled with a plethora of valuable information and tips to help fellow copywriters out. If you’ve dreamed of moving into the six-figure world of freelancing, Ed Gandia is one of the coaches who can help you get there. This content marketing podcast hosts interviews with the top freelancers in the business writing world, and covers all kinds of topics that can help you up your game. This podcast, hosted by Todd Henry, is thought leadership for thinkers. If you plan to go big, launch your brand, take over the world with your ideas, you should be listening every week. If you’re looking for big ideas to inspire you, even though you don’t plan on taking over the world, you should still listen weekly. Erik Fisher is clearly dedicated to making each of his listeners a calmer, more focused, more creative, more productive human. Many of his guests focus on the importance of taking breaks, being good to oneself, and not just going full tilt in your career which, when you’re self-employed, can be extremely challenging. Every writer should listen to at least a few episodes of Grammar Girl, no matter how perfect they consider their writing. From the knack of using semicolons to the minute differences between extremely similar words, I guarantee you’ll come away having learned something. This podcast is really to inspire those of us who look to longform journalism as the ultimate gig. If you love reading The Atlantic’s big think pieces, or live for the New York Times’ investigative reporting, this is where you can hear long, thoughtful conversations with the writers who write them. Part inspirational and part educational, this podcast, hosted by Srini Rao features interviews by thought leaders at the top of their field. And we’re not talking about a few interviews, here; we’re talking about more than 500. You can find material covering creativity, peak performance, and more. This is definitely a podcast for the fiction writer. Now in its thirteenth season, Writing Excuses started out as a panel of published others from different genres talking about topics like character arc and how to insert elements of horror (or humor, or romance) into your writing, as well as the business side of writing novels. Due to its extreme popularity, there’s now a book by the four main hosts, in which they each wrote a short story and then dissected it for readers to understand better. They also host an annual writing retreat on a cruise ship, and I’m looking for someone to sponsor my tuition in case you’re wondering. If you’re looking for a podcast that covers the nitty-gritty of writing books (and so much more), from the act of sitting in the chair to write the first draft, to finding an agent, to self-promotion, this is the one to listen to. Co-hosts KJ Dell-Antonia and Jessica Lahey are writing royalty, the former being a past editor at the New York Times and the latter being a NYT-bestselling author. When you’re struggling to make ends meet as a freelancer, or struggling to escape the 9-5, a side hustle is essential. This podcast can help you figure out where you can earn money quickly, or give you ideas on how to implement that side hustle you’ve been dreaming of pulling off for years. Laura is a successful freelance writer who shares all her best advice about building a fulfilling and sustainable business. Contena Coach, Amanda, joined for an episode about landing quality freelance writing opportunities. Check it out here. I wish I could say that it doesn’t really matter if you listen to any of these podcasts, that you’ll be just as productive, just as effective a writer, but I’d be lying. What I do have to say is that some of the things I’ve learned while listening to these podcasts have made me a better writer and business person. All while I’m going grocery shopping or going for a walk.